"Racism is not our prop. It is not ours to hold up to compare breastfeeding discrimination against." "The Most Peaceful Time of Day" from KellyNaturally.com: Me, too! Sometimes I think, wouldn't it be easier if I had a put-down-and-run routine? But for now, I can't trade this peaceful time of soothing to sleep. 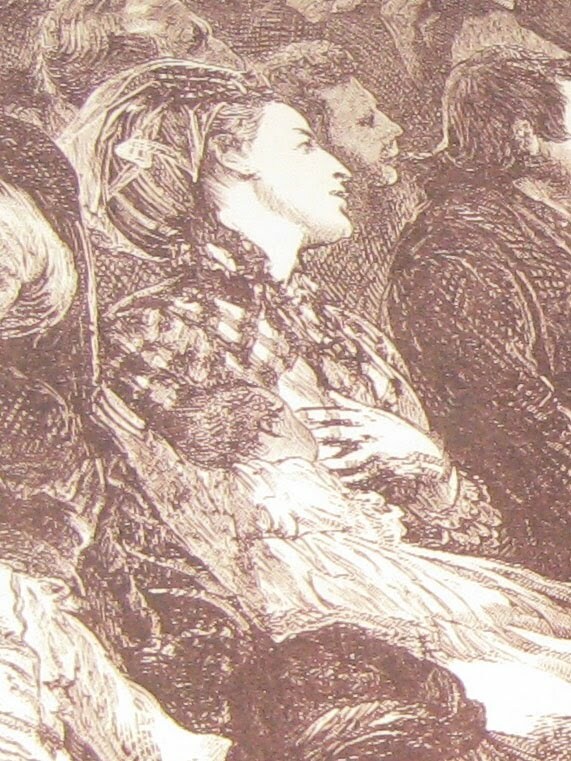 "Breastfeeding history moment: LDS Sacrament Meeting, 1871" from Stand and Deliver, via the bee in your bonnet: I'm a sucker for old-timey breastfeeding pictures that show how it was done in real life. "Danger in a Spray Bottle: Why It’s Time to Change Our Childproofing Strategy" from DrGreene.com: In 2006, nearly 12,000 U.S. children made trips to the emergency room for an accidental contact with a household cleaner — primarily poisoning. I love vinegar plus water in a spray bottle for cleaning, but over time, other poisonous cleaners (even natural ones) have made their way back into our house. I like this perspective on keeping all cleaners (or as many as possible) in the nontoxic range, to prevent unintentional child poisoning. I'm going to do another run through our cabinets and try to find non-poisonous and streamlined alternatives to everything we need. For parents of children age 6 or under, doctors’ advice to lock-up toxic cleaners is no longer adequate. Instead, childproof by replacing products whose labels must say Danger, Warning, Harmful if Swallowed, or Use in a Well-Ventilated Space. If the label gives instructions for calling poison control or for emergency treatment, the product is dangerous." 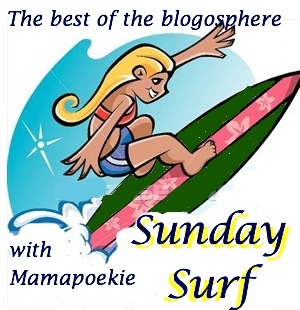 I am very pleased that Paige's FeedBurner guest post helped me make this Favorites feed on my long-neglected top posts page. Now the list will update automatically as I add posts to the "favorites" category. 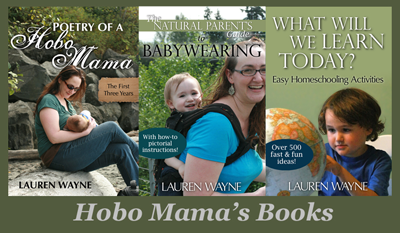 If you are a new Hobo Mama reader, you might browse through the list for posts and topics other readers found interesting, and if you're a dedicated fan, feel free to suggest posts you want to nominate for inclusion. Like this fine, fine example of journalism. Hey, don't knock it — there's a funny video at the end! A WondaWedge Inflatable Back Support Pillow for nursing, pregnancy, reading in bed, & relaxing on the beach. It's a $24 value and is open to my fine U.S. friends. The Surprise Hobo Mama Giveaway, wherein you will definitely win Hobo Mama calling cards and will be entered into a drawing for other fabulous prizes, as yet unannounced. It's almost spooky, it's so tantalizingly vague! Open worldwide. Enjoy "The Oregon Trail — Official Trailer" below from Half Day Today: Did you use to play the original Oregon Trail game? That was my favorite part of computer class, on our Apple IIes, and now it's been brought to the (mock) big screen. I can't decide if my favorite line is "No one wants to be the carpenter," "But, son, we can only carry back ten pounds," or "Just the bullets." I think I'm going to have to go with "Just the bullets." I'm excited to read that guest post, since um doing that transition myself (decided not to return full time after finishing my part time leave). can you have someone write about extended breastfeeding? i am only in my 4th month and i feel like my milk is starting to dry up or my baby feeds for a very long time! how do people keep it going for so long? Lauren, I'm honored you included me in your weekly wrap-up! Thank you for sharing all of these interesting links! Ah! Love the Oregon Trail trailer! Ha ha ha! That was hilarious!